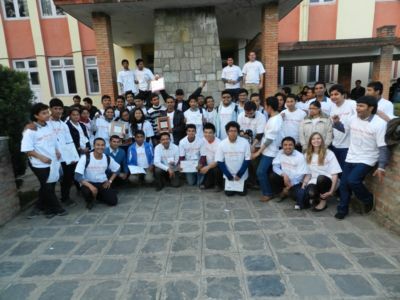 The OPEN DATA day is celebrated by organising and participating in different activities on February 23, 2013 at Kathmandu. The program was organised by Young Innovations Pvt. Ltd, The World Bank and Mozilla Foundation where as Kathmandu University, Department of Civil and Geomatics Engineering; Geomatics Engineering program, Wikimedia Nepal, Institute of Engineering (IOE), Nepal Engineering College, Open Source Ascol Circle and FOSS Nepal were the co-organiser of the program. The presentations on different open data issues stall visits Mapathon, Treasurer Hunt game, Hackathon were the events organised in the day. The Geomatics Engineering II year and III year students actively participated in these events. They were involved in editing, digitising aerial imagery and also in treasurer hunt game. Kathmandu University, Department of Civil and Geomatics engineering; Geomatics Engineering program kept stall to disseminate the information about the various programs of Kathmandu University, Geomatics Engineering students project and other activities carried out by the Department of Civil and Geomatics Engineering. The curious citizens, Journalist, students, scientists, graphic designers and policy makers visit the stall kept by various organisers and co-organisers. The organisers awarded certificate to the participated students in the events.